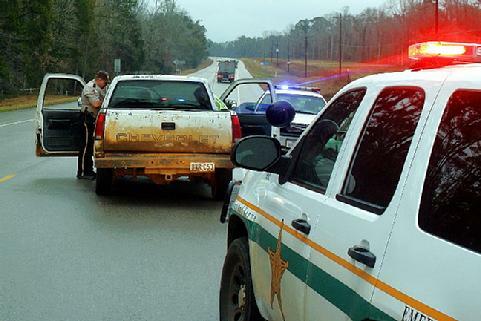 Deputies were able to finally get the stolen vehicle to stop near the Liberty County line. 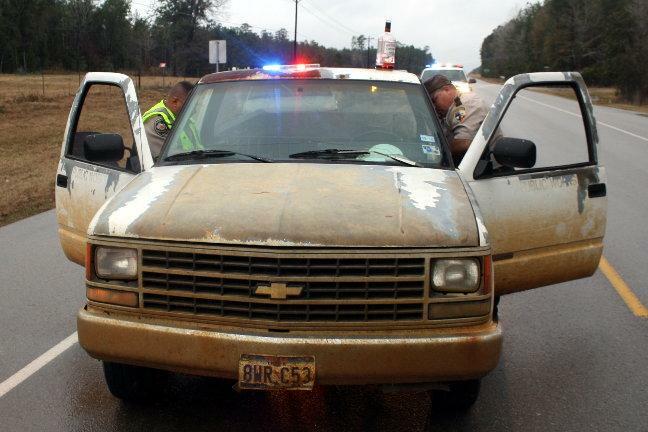 Intoxication, Evasion, Auto Theft, BIG THICKET, January 20, 2010 - At approximately 4:45 pm on January 20, 2010, a call came to the Polk County Sheriff's Office to report a reckless driver that was south-bound on US-146. 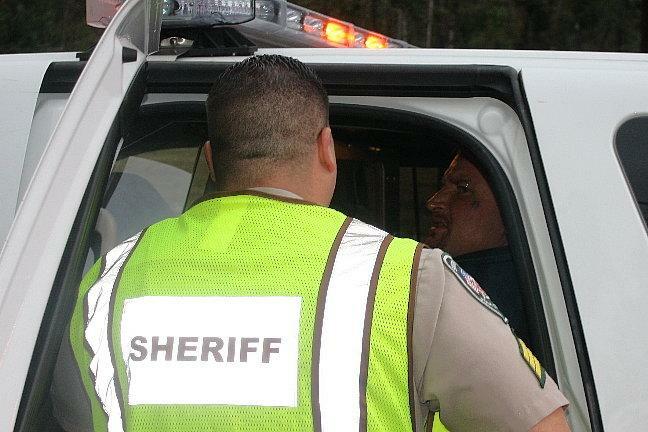 Deputy Mark Dubose was dispatched and caught up with the older model white Chevy truck in the Schwab City area, however, the driver refused to pull over. A chase ensued with speeds that reached over 80 miles per hour. According to witnesses, the driver of the truck, Kevin Roundtree, 38, of Big Thicket, was driving into the north-bound lane nearly having multiple head-on collisions with oncoming traffic. 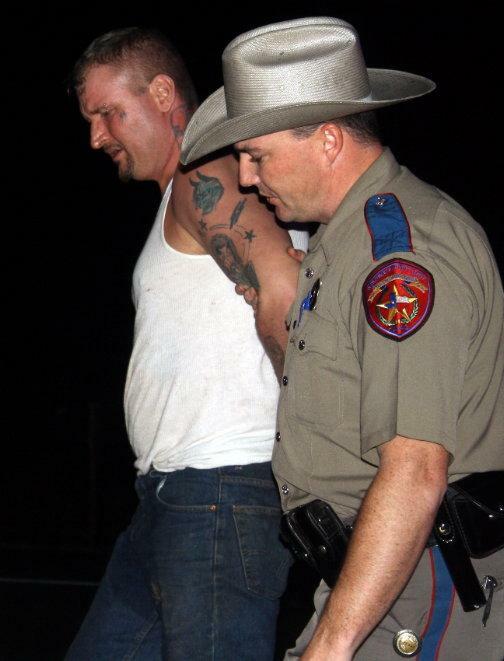 The chase finally ended when Roundtree stopped on 146 near Painters Drive. 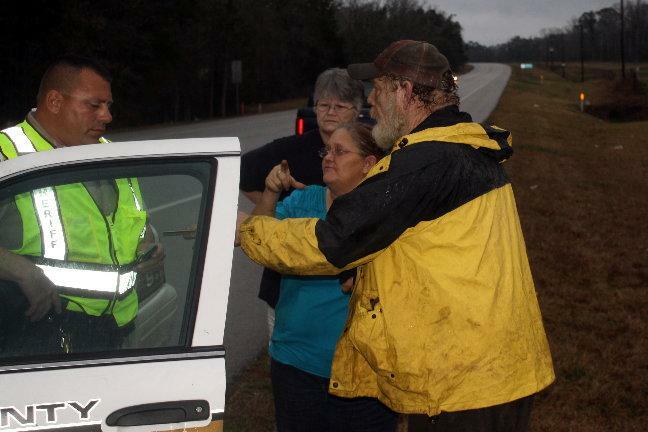 By now, Liberty County had been notified and had one of their own deputies that drove up where Roundtree pulled over. The deputies apprehended Roundtree and placed him in the back of Dubose's patrol unit. 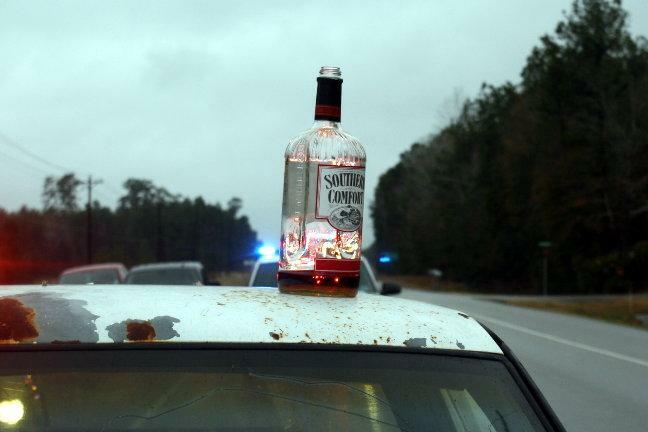 A search of the vehicle rendered a bottle of Southern Comfort Whiskey that was nearly drained. As the deputies were sorting things out, the real owners of the white truck pulled up. 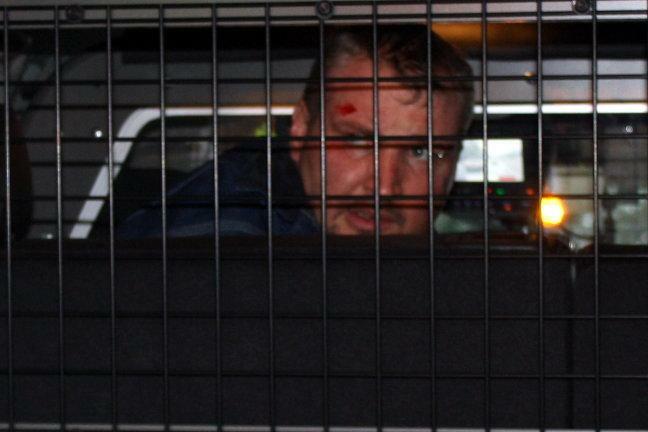 According to witnesses, Roundtree stole a Dodge truck and drove it until it ran out of gas, Roundtree then hitched a ride with some people and carjacked their vehicle at R&D Grocery on US-146. Intoxicated, Roundtree headed south on 146 where Deputy Dubose caught up with him. 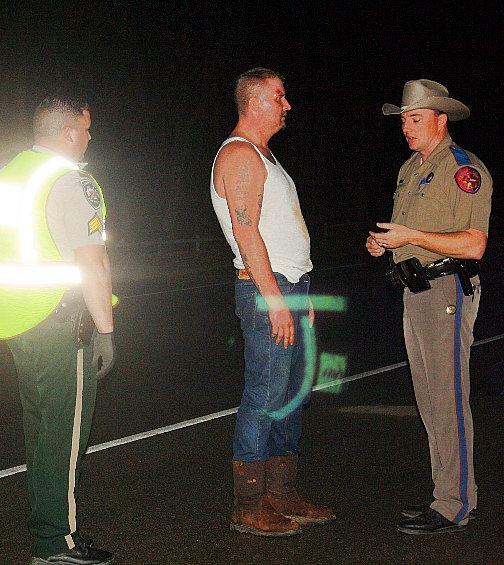 DPS Trooper David Flowers was summoned to perform a field sobriety test on Roundtree who was placed under arrest and charged with suspicion of driving while intoxicated, evasion, and possibly two counts of unauthorized use of a motor vehicle. The scene was cleared by 6:30 pm. The incident remains under investigation. A search of the vehicle turned up a large bottle of Southern Comfort Whiskey (nearly drained). Hacked: Kevin Roundtree glares out the back of a patrol unit, apparently filled with anger. When Deputies attempted to talk to Roundtree, he would cuss them out using extreme profanity. Deputy Mark Dubose listens as the owners of the truck tell what transpired. Roundtree allegedly carjacked their truck. 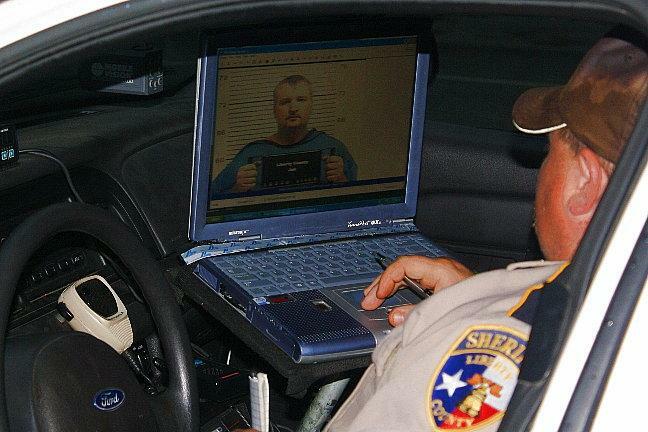 A Deputy from Liberty County pulls up previous arrest information on Roundtree (Roundtree was recently arrested in Liberty County). Once Roundtree calmed down, DPS Trooper David Flowers was able to talk to him. 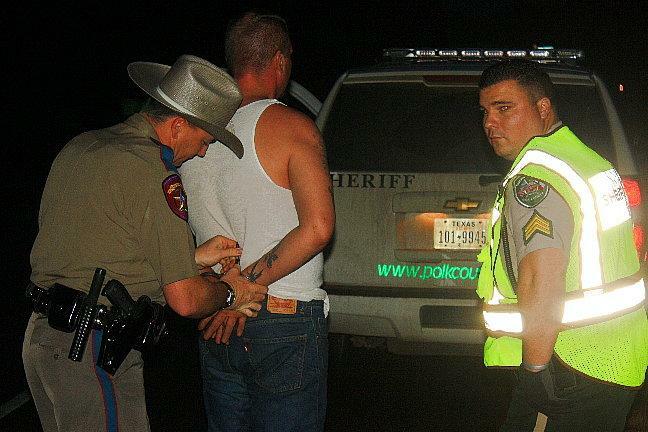 Trooper David Flowers places Kevin Roundtree under arrest. Going downtown: Kevin Roundtree will face a slew of charges.